The formiminotransferase (FT) domain of formiminotransferase-cyclodeaminase (FTCD) forms a homodimer, with each protomer being comprised of two subdomains. The formiminotransferase domain has an N-terminal subdomain that is made up of a six-stranded mixed beta-pleated sheet and five alpha helices, which are arranged on the external surface of the beta sheet. This, in turn, faces the beta-sheet of the C-terminal subdomain to form a double beta-sheet layer. The two subdomains are separated by a short linker sequence, which is not thought to be any more flexible than the remainder of the molecule. The substrate is predicted to form a number of contacts with residues found in both the N-terminal and C-terminal subdomains [(PUBMED:10673422)]. In humans, deficiency of this enzyme results in a disease phenotype [(PUBMED:12815595)]. 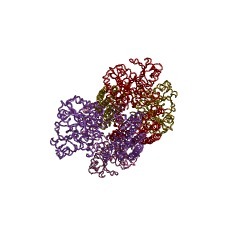 This entry represents the C-terminal subdomain of the formiminotransferase domain. There are 2848 FTCD domains in 2847 proteins in SMART's nrdb database. Taxonomic distribution of proteins containing FTCD domain. This tree includes only several representative species. The complete taxonomic breakdown of all proteins with FTCD domain is also avaliable. Click on the protein counts, or double click on taxonomic names to display all proteins containing FTCD domain in the selected taxonomic class. The crystal structure of the formiminotransferase domain offormiminotransferase-cyclodeaminase: implications for substrate channeling in abifunctional enzyme. BACKGROUND: The bifunctional enzyme formiminotransferase-cyclodeaminase (FTCD)contains two active sites at different positions on the protein structure. 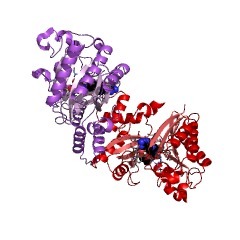 Theenzyme binds a gamma-linked polyglutamylated form of the tetrahydrofolatesubstrate and channels the product of the transferase reaction from thetransferase active site to the cyclodeaminase active site. Structural studies of this bifunctional enzyme and its monofunctional domains will provide insight intothe mechanism of substrate channeling and the two catalytic reactions. RESULTS:The crystal structure of the formiminotransferase (FT) domain of FTCD has beendetermined in the presence of a product analog, folinic acid. The overallstructure shows that the FT domain comprises two subdomains that adopt a novelalpha/beta fold. Inspection of the folinic acid binding site reveals anelectrostatic tunnel traversing the width of the molecule. The distribution ofcharged residues in the tunnel provides insight into the possible mode ofsubstrate binding and channeling. The electron density reveals that thenon-natural stereoisomer, (6R)-folinic acid, binds to the protein; thisobservation suggests a mechanism for product release. In addition, a singlemolecule of glycerol is bound to the enzyme and indicates a putative binding sitefor formiminoglutamate. CONCLUSIONS: The structure of the FT domain in thepresence of folinic acid reveals a possible novel mechanism for substratechanneling. The position of the folinic acid and a bound glycerol molecule nearto the sidechain of His82 suggests that this residue may act as the catalyticbase required for the formiminotransferase mechanism. 1qd1 THE CRYSTAL STRUCTURE OF THE FORMIMINOTRANSFERASE DOMAIN OF FORMIMINOTRANSFERASE-CYCLODEAMINASE.